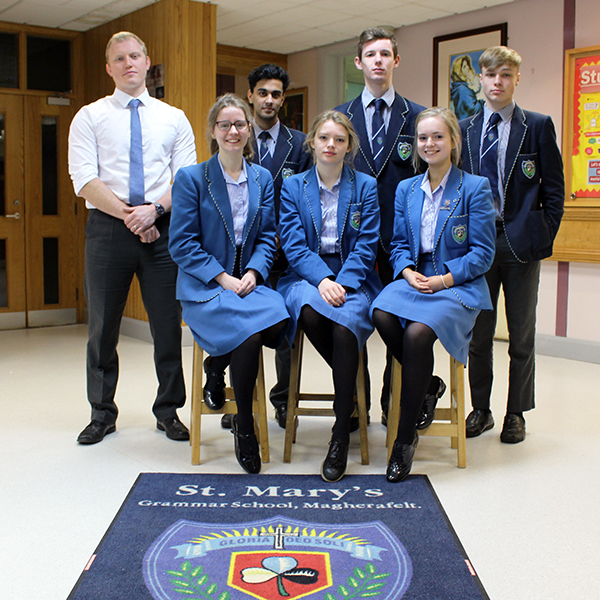 All nine entrants from St. Mary’s achieved Commendations for their efforts. This competition is designed to encourage further thinking and problem solving in Physics; to recognise excellence in the subject; and to select students for the UK team competing in the International Physics Olympiad. The first round consisted of two written exams of very high-level Physics questions. All nine entrants from St. Mary’s achieved Commendations for their efforts. The participating students were Donal Lynn, Hannah Maguire, Aoife Mulvenna, Liam Mullan, Niamh Lagan, Aaron Hughes, Micheal McLaughlin, Katherine Shields and Anish Bedi. Physics teacher, Dr J. Coulter, pictured with some of the participating students.